I just posted a letter to the Taoiseach. To say I’m a bit worked up about the direction this country we’re going in under his leadership would be an understatement. 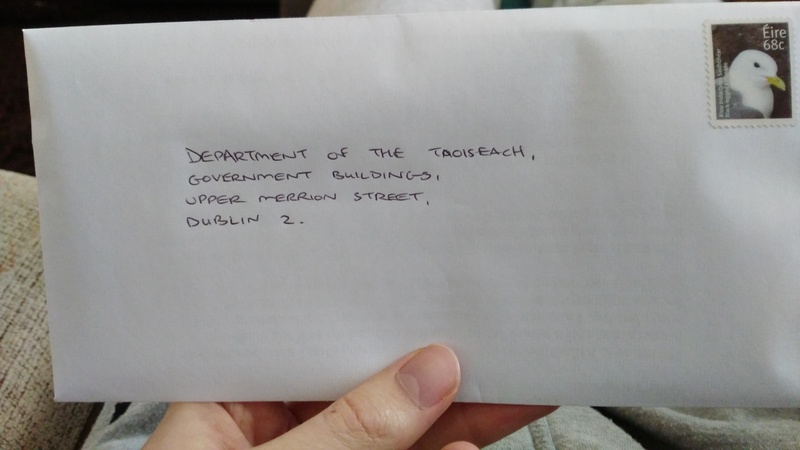 I’ve been signing petitions and protesting when I can, but I felt that I needed to let him know how this government’s neo-liberal agenda is affecting me personally, rather than just being another voice in a crowd (albeit a crowd that has an ever more unified and louder roar thanks to issues like water charges politically activating our normally oh so quiet populous). The letter will arrive to government buildings, but whether it’s opened or read, never mind replied to, is a totally different possibility. I’d love to be proven wrong. One individual letter might be a Complete Waste of Time, however, if enough of us voiced our individual concerns via letters, maybe they would take notice? Says you, sure they know full well how we feel, the budget for next year is set and the current shower only have a few months before an election that could well see a FF/FG government, so what’s the point? The point is, our society (or at least 99% of it) can’t take another five years of austerity, regressive taxation and second-placing of citizens in favour of unfettered corporate capitalism. Take the time to sit down and get it off our chest. What are they doing wrong? What needs to be improved? Public servants are there to serve the public after all. Have your points ready when they slither up to your door in electioneering mode. And don’t let them skulk away until you have aired your grievances. Anyway, I’m going to share the text below. Underneath this I’ll be including a few links that helped me piece this together. My name is Killian Redmond. Within the last two years, I have become both a homeowner and a proud father. This has changed my outlook in life considerably. I am writing to you today however, as I am becoming increasingly concerned over the direction this country is taking. I am genuinely worried about the Ireland that my son will grow up in. If the budget were as generous to the 376,000 people living in consistent poverty as it was to foreign multinationals we would see a massive improvement in the living conditions of those most in need. Foreign direct investment is not the silver bullet it is unfairly portrayed as. If anything, its benefits are constantly misreported. I draw attention to you stating that there are 250,000 people employed by foreign multinationals when you spoke in Google’s HQ in May 2012. There were only 150,000 employed at that time. If anything, Ireland is being used as a base for routing profits to cut multinational tax bills. Why isn’t the government taxing proportionally? Multinationals did not pay the 12.5% rate. What makes you think they will pay 6.25% or is it for fear that they might up and leave? We should be taxing progressively so that those most in need (the unemployed, the poor, single parents, the sick, the elderly, etc.) can be provided with the assistance they need and as a result, a decent quality of life. I have kept a close eye on both Project Eagle and Project Arrow. I just read this morning that NAMA has selected Cerberus as the preferred bidder for Project Arrow. It is beyond me how NAMA is even negotiating with a company that has criminal proceedings against it in both Northern Ireland and the U.S. I understand that the original value of €6.25bn could not be met by non-performing loans, however, it seems that the sale price could be around the €1bn mark. Mr Daly describes this as “the best achievable return for the State”. Further, 43% of the assets concerned are residential. There is a housing crisis in this country and NAMA are selling residential units for less than the price it cost to build them. Why doesn’t the government step in and halt the proposed sale? Surely you should call an immediate investigation if NAMA is proposing to sell property to a potentially criminal American investment fund? There is not just a housing shortage in this country; there is clearly a homelessness crisis. The number of families living homeless in Dublin has increased by 100% over the last year according to the Dublin Region Homeless Executive. A lot of these families are homeless as a result of being unable to pay increasing rents and resultantly being evicted. Groups such as Focus Ireland and Inner City Helping Homeless are doing fantastic work but cannot keep indefinitely overstretching their services. The government needs to step in and declare an emergency. There are a huge number of derelict sites around the city, why can’t Compulsory Purchase Orders be applied to these sites and get them developed? Not only would you be cleaning up the huge amount of derelict and vacant sites around the city but also providing employment and giving people homes and hope. The failure of the recent budget to introduce rent controls was beyond disappointing as it leaves thousands of families and individuals at the mercy of private landlords. I am lucky enough to own my own house, however, many of my friends are trying to find somewhere to call home. Unfortunately, what’s happening at house viewings now is that landlords are swaggering in, having a quick look around and buying up these houses. They are denying young people their homes so they can buy to let. They are keeping our generation in a perpetual loop of renting and putting their lives on hold. You need to address the landlords; some sort of limit on buying to rent has to be introduced alongside certainty of rent. I believe there is a lack of political will but I would love to be proven wrong. I would like to draw your attention to Cuan Álainn, a women’s refuge in Tallaght that is scheduled to close before Christmas. This centre provides an invaluable service to vulnerable women and children. Its closure would leave them with two choices. One is to return to an abusive relationship. Two is to become homeless. The annual running cost of Cuan Álainn is €350,000. Looking at this from a financial viewpoint, I estimate that it will cost a lot more for South Dublin Council to put these women and children into emergency accommodation, i.e. hotels, for a year than it would for the government to step in and keep the refuge open. I have already voiced my concern over this proposed closure with Minister Reilly’s office. I have always been proud to be Irish, a neutral nation that punches above its weight when it comes to sport, culture and the arts; one that does not have to subscribe to international sabre-rattling. Sadly, we are not neutral anymore. The use of Shannon Airport by U.S. forces on their way to kill civilians and blow up hospitals in the name of democracy began with Fianna Fáil and has been maintained by your government. Fine Gael and Labour both agreed to a document in 2011 stating that “we will enforce the prohibition on the use of Irish airspace, airports and related facilities for purposes not in line with the dictates of international law.” Four and a half years later and we are facilitating the mass murder of civilians in Yemen, Syria, Iraq and Afghanistan. Only last Saturday three Omni Air aircraft passed through Shannon, each with between 240 and 380 American military personnel on board, with weapons. One can only guess the contents of these planes, because there are only two certainties: one, that this government will never step up to America and search these planes and two, that we have the blood of innocent men, women and children on our hands. I am also extremely disappointed to learn that the Irish government has spent €14.7m on Israeli military hardware since 2005, as well as selling €6.42m worth of such equipment to Israel since 2011. I am sure you are aware of the brutal occupation of the Palestinian Territories and the system of apartheid that has become daily life for the Palestinian people. Engaging in arms trade with Israel is only perpetuating the misery that Palestinians have to endure. I find it hard to digest that in the run up to the centenary of 1916, Ireland sides itself with the oppressor, not the oppressed. The government needs to boycott and divest from Israel and support the Palestinian people in their right to self-determination, which is an integral human right. Why doesn’t Ireland punch above it’s weight like it did when facing up to South African apartheid in the 1980s? I am extremely concerned about the proposed TTIP deal. I have already called MEP Brian Hayes’s office in relation to this. This deal will decimate jobs, food quality standards and labour rights. 92% of the meetings held in the preparatory phase of TTIP were with representatives of companies: corporate lobbyists are having a huge say, with consumer groups and trade union representatives being left out in the cold. It appears to be nothing more than a corporate power grab, leaving our elected officials with the option of either agreeing or disagreeing with the conclusions of secret agreements and not being given an option to propose amendments. I was disappointed to hear, through the German news website Correktiv.org, that “Ireland expressed concern at the slow progress of the new negotiation and called for ‘new momentum’.” This was via a leaked document which seems to be par for the course in terms of finding out anything about the negotiations. How can you think this could be a positive thing for Ireland? We will be at the mercy of corporations who can sue the state for losses on projected earnings through ISDS because we might want to protect our consumers and environment. I do not want my son to grow up in an Ireland where fracking and GM food are the norm. I do not want my son to grow up in a country where the government is at the whim of corporate profits and ‘the market’. I do not want my son to grow up in a world where unregulated capitalism runs rampant in its quest for constant growth and ever-increasing profits, destroying our environment while ignoring the consequences for future generations. If millions of people tell their democratically elected officials that they are opposed to this trade deal, those democratically elected officials need to take notice and put the brakes on this deal, not try to accelerate it. My son is six months old and I have already applied for a place for him in two Educate Together schools, both of which have huge waiting lists. We are not Catholic and will not baptise him for the sake of getting a school place. It is disrespectful to those who practice Catholicism. I am quite worried at finding a place in school for him when more than 90% of state schools are run by the Catholic church. If my son isn’t baptised, he’s way down on the admissions list and this simply is not fair. Our schools should represent the fact that there are an ever-increasing number of non-Catholics in this country. Article 44.2.3 of our constitution says “the state shall not impose any disabilities or make any discrimination on the ground of religious profession, belief or status.” At present it feels like we are going to be forced into baptising our son in order to get him a school place in our locality. There needs to be a seperation between church and state when it comes to education. Finally, I call on you to make efforts to decriminalise abortion in this country. We need to have a referendum to repeal the eighth amendment. We need to respect the women of our country. Women bear most of, if not all, the responsbility of contraception, pregnancy and childbirth. To often they have to do it on their own. We need to follow up on the great victory for equality that was the Marriage Referendum. It is not an equal society that we live in until women have the freedom to make choices over their own bodies. I thank you Taoiseach for taking the time to read this letter. I would be happy to provide links to any of the numbers or quotations I presented in this letter. I am not an expert in finance, taxation or international trade but I am a citizen who wants a bright future for his family and feel obliged to voice my concerns.